The Trifecta by Jack Armour, have a large lens with a slight curve in the frame front. 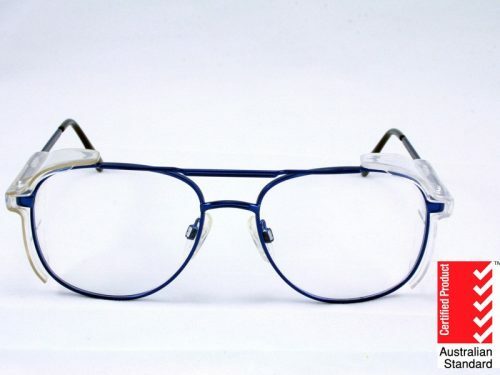 They have a removable and replaceable foam gasket to make these positively sealed safety glasses. 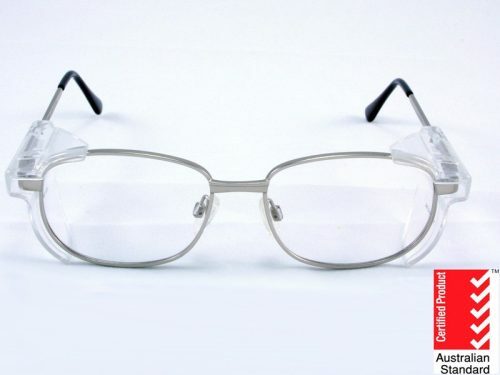 These safety glasses prescription are suitable for single vision, bifocal and progressive lenses. They meet Australian and International standards 1337.6 medium impact. They also have an adjustable strap that can be added to the frame. The Trifecta by Jack Armour is a plastic (non-conductive) pair of certified medium impact safety glasses prescription. With a flat-ish frame front a wide temples that wrap-around the face to provide protection. 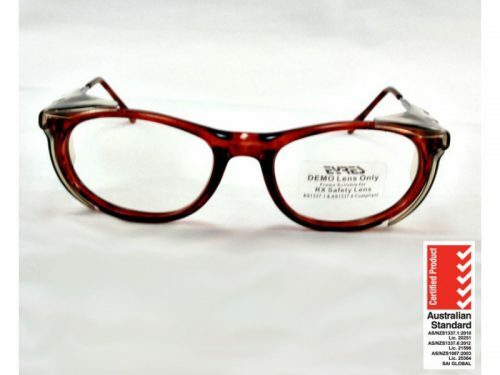 As this frame has a relatively flat frame front, it is perfect for the bifocal, progressive a higher prescriptions. Listed price includes clear single vision lenses, certification and shipping worldwide. The only metal part of the Trifecta frame is the screw holding the side onto the frame front. As the frame has a plastic bridge this, makes it a comfortable safety frame as the frames weight is spread across the whole nasal bridge. Much like your standard plastic sunglasses frame for wearer comfort. These nose pads are adjustable, making the wearers comfort a priority. These safety glasses prescription, come with a spare gasket and the elastic strap that clicks into the ends of the arms on the glasses. So if you have trouble with the frame sliding off your head, this frame may be the answer. You can choose to personalise your safety glasses. With special coatings and lens options and transition. 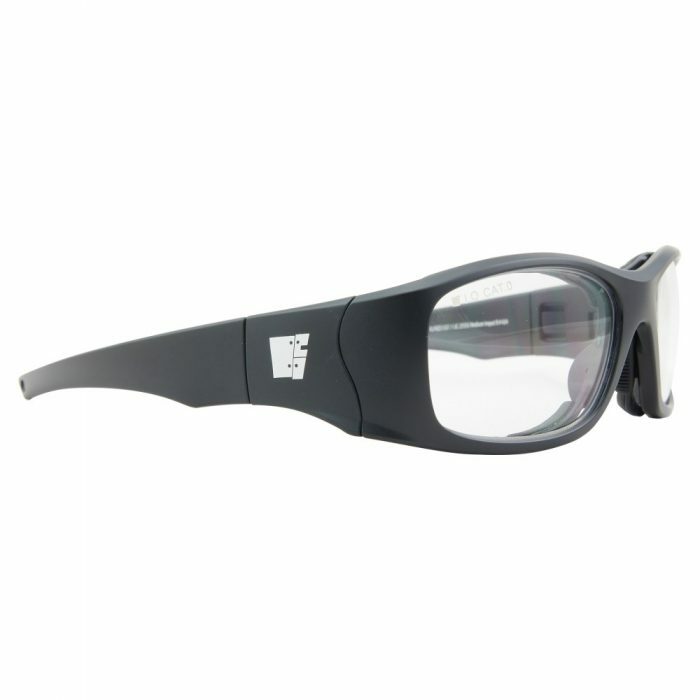 Though there are many other options, such as polarised, if you would like them to be sunglasses. 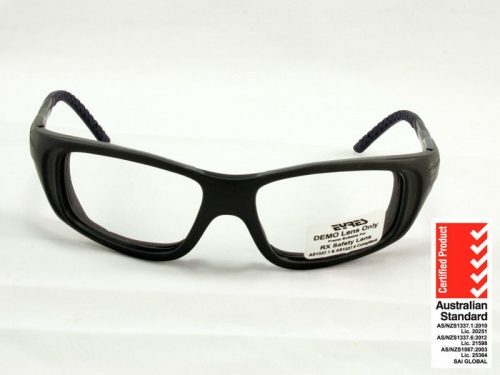 An excellent choice for those who like safety glasses with the comfort of a plastic frame, but more stylish in design than the older styles. Get your prescription ready and order your new safety glasses online TODAY!